Learning Disabilities - catch, body, causes, What Are Learning Disabilities? Learning disabilities are disorders that affect people's ability to interpret information that they see or hear or to link information processed in different parts of the brain. A person with a learning disability may have specific difficulties with language, visual information, or coordination, which in turn can make it very hard to read, spell, write, or do math. Learning disabilities differ from learning problems (which are less severe) and from mental retardation (which refers to more global learning difficulties). Not every learning problem is a true disorder or disability. Some children are just naturally slower than others in developing certain skills, but most children usually catch up and achieve within the normal range for their age and abilities. Children who are mentally retarded, on the other hand, will never be able to learn and function socially like other children their age. Their general intellectual capacity is much lower than average. Children with mental retardation have learning problems but do not truly have learning disabilities. Children with learning disabilities typically have average or even above-average intelligence, so they have a marked difference between their intellectual capabilities and what they are actually achieving. In a sense, a person with a learning disability is like a radio that is not tuned exactly to a station. There is nothing wrong with the radio itself or with the signal coming from the station, but the music still sounds garbled. Similarly, people with learning disabilities can see and hear as well as others and have normal general learning capacity, but there is a problem with the way their brains process information. Learning disabilities are generally classified into two main categories: verbal (having to do with the uses of spoken and written words) and nonverbal (having to do with interpreting visual or spatial information). Developmental speech disorders are usually diagnosed in very young children who have persistent trouble making certain speech sounds; for example, they may say "wabbit" instead of "rabbit" or "thwim" instead of "swim." Often these speech disabilities improve with age or with the help of a speech therapist. Developmental language disorders involve the way that children express themselves or how they understand others' speech. Children with this type of disorder may speak in short phrases instead of full sentences, call objects by the wrong names, have disorganized speech, misunderstand words, or have difficulties following directions. Reading is a very complex task in which a person has to focus attention on the printed marks, control eye movements across the page, recognize sounds associated with letters, understand words and grammar, build images and ideas, compare new ideas to what is already known, and then store the ideas in memory. This process requires a rich, intact network of nerve cells that connect the brain's centers of vision, language, and memory. A problem in any of these areas or the connections among them can lead to difficulties with reading. Dyslexia (dis-LEKS-ee-uh) is the most common and best-known of the reading disorders. It affects 2 to 8 percent of school-age children. Because children with dyslexia have trouble processing the smallest units of language that make up words, they may have trouble with rhyming games or with sounding out individual letters or syllables to form words. In the mid-1900s, a doctor named Samuel Orton found that several children he was working with had similar problems with reading. In addition to confusing the letter "b" with "d" and the letter ap with "q," some could read more easily if they held pages up to a mirror. Orton named this condition strephosymbolia (STREF-oh-sim-BOL-ee-uh), which means "twisted symbols." Now strephosymbolia is called dyslexia, which is derived from the Greek words "dys" (meaning poor or inadequate) and "lexis" (meaning words or language). Further research has shown that dyslexia involves much more than just seeing letters backwards or reversed. Children with this disorder describe how printed letters and words seem to jump around on the page or that sounds and letters get mixed up or jumbled together. Researchers originally thought that visual and motor problems were at the heart of dyslexia, but they later found that reading disabilities stem from a difficulty with processing the smallest units of language, which are called phonemes (FO-neemz). For example, the "p" of pat and the "f" of fat are two different phonemes, and the word fat has three phonemes linked together. Someone with dyslexia might have trouble telling the difference between these sounds when reading them. Learning involves a complex series of events. 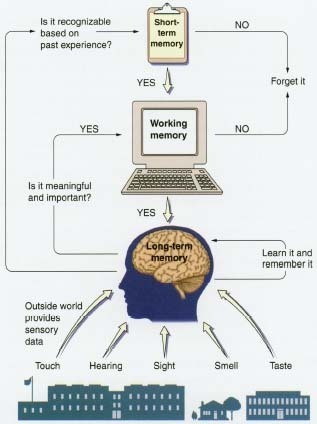 The brain receives new information from the outside world all the time, but in order to learn new information, the brain must recognize the information's importance, interpret it, analyze its meaning, and store it in memory for later use in processing new information. If the brain does not recognize new information as meaningfil and important, it will discard it. Learning disorders affect different aspects of this complex process of recognizing, interpreting, understanding, and remembering new information. what one reads. A person with this type of disability can read each word but may find it hard to understand the text, form images, or relate new ideas in the text to those in memory. These reading disabilities usually are discovered at a later age than is dyslexia. A writing disability can result from problems with any area of the brain that controls grammar, hand movement, vocabulary, and memory. Children who have trouble mastering the motor skill of writing are said to have dysgraphia (dis-GRAF-ee-uh). Nonverbal learning disorder (also called nonverbal learning disabilities), or NVLD, is not as well understood as verbal learning disabilities. People with NVLD often have problems with visual perception, with recalling visual details, and with spatial relationships. Their eyesight is fine, but they may have trouble processing what they see; for example, a student might find it hard to follow a set of instructions demonstrated by a teacher. Students with NVLD often find it hard to focus on nonverbal academic material as well, which can make it hard to learn math (a disorder called dyscalculia (dis-KAL-kyoo-lee-uh)) and science. They may have trouble recognizing numbers and symbols, memorizing facts such as the multiplication tables, aligning numbers, and understanding abstract concepts like place value and fractions. In both math and science class, students may have difficulty solving problems, forming complex concepts, and making educated guesses and then testing them out. Reading comprehension may be affected as well. Even though students with NVLD may read words and sentences with ease, they might not understand the underlying organization of the story. Dealing with brand-new material is likely to overwhelm children with NVLD. Some children with NVLD have trouble in other areas as well. They may have poor motor skills and problems with coordination; for example, learning to ride a bike can be very difficult for a child with NVLD. They also may have trouble socializing with other children because they do not pick up on nonverbal social cues, such as tone of voice and body language, or they tend to say the wrong thing at the wrong time. Children with NVLD tend to be easily frustrated and upset. Any new situation can make them anxious because they may have more difficulty adjusting to it. There are many other subtypes of learning disabilities, but verbal and nonverbal learning disabilities are the two main categories. Because many aspects of speaking, listening, reading, writing, and arithmetic overlap and build on the same brain capabilities, it is not unusual for someone to have more than one disorder. For example, most disorders that hinder the ability to understand language will also interfere with learning to read, spell, and write. Attention Deficit Hyperactivity Disorder * , or ADHD, can also interfere with learning. Children with ADHD often have difficulty focusing on any one task for a period of time. Children with attention problems may have learning problems but attention deficits are not classified as specific learning disabilities. However, more than half of children with ADHD also have learning disabilities. * Attention Deficit Hyperactivity Disorder, or ADHD, is a condition that makes it hard for a person to pay attention, sit still, or think before acting. Parents and teachers are usually the first to notice signs of a possible learning disability. A very young child might not speak or listen as well as other children their age or might have trouble with a game's directions or other activities that other children complete with ease. The classroom teacher may notice persistent difficulties in reading, writing, or math. The first step in diagnosing a learning disability is to rule out any other possible causes, such as vision or hearing problems or some other medical condition. Once a doctor makes sure that other problems are not to blame, the child might be evaluated by a psychologist * who specializes in learning disabilities. Diagnosing a learning disorder often takes time. The psychologist usually takes a careful history of symptoms, interviews the child, and gives certain tests that compare the child's level of ability to what is considered appropriate for a person of that age and intelligence. Why Do People Have Learning Disabilities? Also, because some learning disabilities tend to run in families, researchers are looking into how learning differences may be inherited. Because children with learning disabilities typically have normal or above-normal intelligence, they often can find ways to learn in spite of the disorder. They may need special school programs for the learning disabled or to work with a learning specialist several hours each week while attending regular classes. Special education teachers can help plan out what is called an Individualized Education Program, or IEP, for a learning-disabled child. This plan outlines the specific skills the child needs to develop as well as appropriate learning activities that build on the child's strengths and work around his or her difficulties. For example, a student with dyslexia might be encouraged to listen to a book on tape for English class, while another with a writing disorder might take notes or complete an assignment using a laptop computer. * psychologist (sy-KOL-uh-jist) is a mental health professional who can do psychological testing and provide mental health counseling. MYTH: Mirror writing is a symptom of dyslexia. REALITY: In fact, backwards writing and reversal of letters are common in the early stages of writing development among children with and without dyslexia. Children with dyslexia have problems in naming letters but not in copying letters. MYTH: Eye training is an effective treatment for dyslexia. REALITY: More than two decades of research have shown that dyslexia reflects a linguistic (lin-GWIS-tik; language-related) deficit. There is no evidence that eye training alleviates the disorder. MYTH: Dyslexia can be outgrown. REALITY: Yearly monitoring of language processing skills from first through twelfth grade shows that the disability persists into adulthood. Even though most people with dyslexia learn to read accurately, they continue to read slowly and do not read automatically. MYTH: Smart people cannot be dyslexic. REALITY: Intelligence is in no way related to language processing skills, and there have been many brilliant and accomplished people with dyslexia, including writers William Butler Yeats and John Irving, scientist Albert Einstein, military leader George Patton, and financial industry leader Charles Schwab. Teens with learning disabilities often find a particular way of learning that works for them. Their methods, along with a regained sense of self-confidence, continue to affect their lives outside the classroom, such as in relationships with others and in their careers. from their classmates at school or even get into trouble because they are frustrated when learning is difficult for them. Children and their families can often benefit by working with a trained counselor or support group. Cummings, Rhoda, and Gary Fisher. The Survival Guide for Teenagers with LD. Minneapolis: Free Spirit Publishing, 1993. Lauren, Jill. Succeeding with LD: 20 True Stories About Real People with LD. Minneapolis: Free Spirit Publishing, 1997. For ages 11 and up. Levine, Melvin. Keeping a Head in School A Student's Book About Learning Disabilities and Learning Disorders. Cambridge, MA: Educators Publishing Services, 1996. Stern, Judith, and Uzi Ben-Ami. Many Ways to Learn: Young People's Guide to Learning Disabilities. New York: Magination Press, 1996. The International Dyslexia Association, 8600 LaSalle Road, Chester Building, Suite 382, Baltimore, MD 21286-2044. LD Online is an interactive guide to learning disabilities for parents, teachers, and children. The website includes in-depth information about learning disorders, an interactive chat room and bulletin boards, the latest news and resources, and a KidZone that features artwork and stories by young people. The Learning Disabilities Association of America (LDA), 4156 Library Road, Pittsburgh, PA 15234-1349. LDA is a national non-profit organization that provides education and support for people with learning disabilities and their families. National Institute of Mental Health (NIMH), National Institutes of Health, 6001 Executive Blvd., Rm. 8184, MSC 9663, Bethesda, MD 20892-9663. The NIMH posts information about learning disabilities at its website. NLD on the Web! is a website that provides information about nonverbal learning disabilities. My World is a photo negative inverted.